Guitarist Jerome "Jah Jerry" Haynes, who has died aged 80 following a brief illness, was a founding member of the Skatalites, the most important set of session musicians in Jamaica during the late 1950s and early 1960s. As leading exponents of ska, the island's first indigenous form of semi-electric popular music, they were central to the development of the country's cultural identity before and after independence in 1962. Jerry's rapid rhythm chords, strummed in a choppy manner, his thumb on a battered acoustic to emphasise the second and fourth beats of every measure, defined its rhythm. Known as "Jah Jerry" because of his Rastafarianism, Jerry spent much of his life in Jones Town, a west Kingston ghetto that borders Trench Town, from which many of Jamaica's best-known artists emerged. In 1948, having tried to teach himself the rudiments of music on his father's guitar, he sought the tutelage of Ernest Ranglin, one of the island's most gifted players. In the mid-1950s, he joined saxophonist Val Bennett's jazz band before playing in bands active on the hotel circuit frequented by tourists and upper-class Jamaicans. Eventually, he joined forces with drummer Arkland "Drumbago" Parks at a time when various Kingston businessmen and sound-system personnel began recording local players. Jerry's first recording session, arranged by Drumbago, yielded Count Boysie's Special, made specially for Count Boysie the Monarch, a sound system based at West Street, Kingston, but the song was retained as a demonstration acetate and never publicly released. By 1959, partly through his connection with Drumbago, Jerry became associated with Prince Buster, a sound-system operator and aspiring vocalist about to enter record production himself; at Buster's first recording session, he is said to have told Jerry to "change gear", resulting in Jerry's trademark rhythmic strumming, as heard on landmarks such as Derrick Morgan's Shake a Leg, Buster's own They've Got to Go and the Folkes Brothers' hugely popular Oh Carolina. Producer Leslie Kong also made use of Jerry's talents on early hits by Jimmy Cliff and Desmond Dekker (obituary, May 27 2006). In 1961, Jerry was contracted exclusively to Clement "Sir Coxsone" Dodd, founder of the Studio One group of labels and recording facility, though he continued moonlighting for other producers. He played on the first session arranged by Vincent "Randy" Chin and on rivals such as Duke Reid, King Edwards the Giant and Lyndon Pottinger. After the break-up of the Skatalites, he remained largely absent from the scene until 1981, when he was featured on trombonist Rico Rodriguez's That Man Is Forward album. Two years later, the reformed Skatalites played at the Reggae Sunsplash festival in Jamaica; its led to US dates and the Return of the Big Guns album (1984). 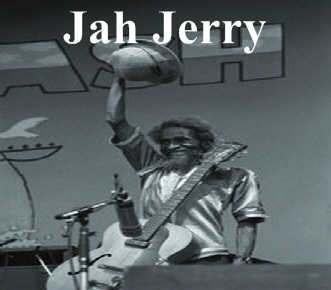 Jerry left the Skatalites in 1986 to live in relative anonymity in Jones Town.